Peak District mountain hares have got to be one of the hardiest animals in the National Park. 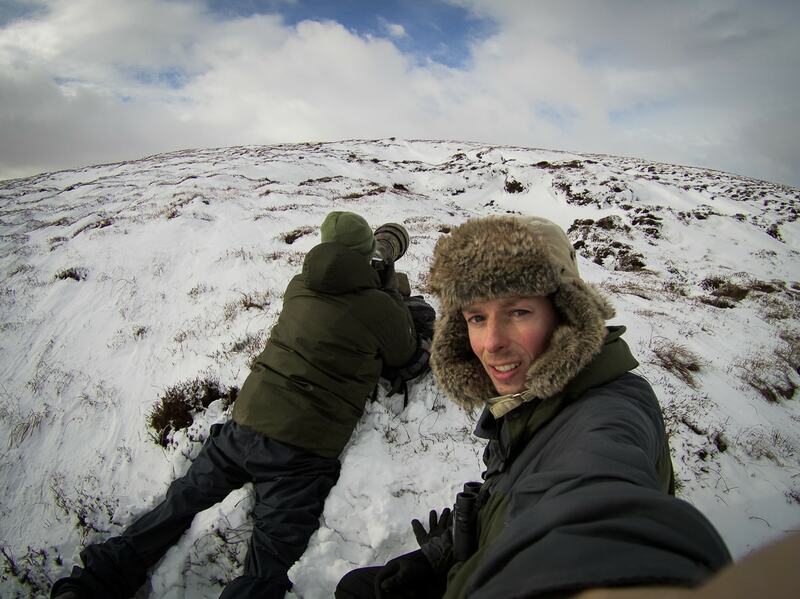 Some wintry conditions offset by some good company made for a great day of photography in the hills. It still feels like the dead of night when I wake up about 5:30am. Creeping around the house as quietly as possible, I boil the kettle, fill my thermos, grab a couple of mouthfuls of surplus coffee and gather my gear. Today, I'm heading into the northern reaches of the Dark Peak, an area of the Peak District named so because of its grit stone composition. This area sits to the north of its counter-part, the White Peak, and is widely regarded as the 'wilder' of the two areas given its more rugged landscape. The goal of the sojourn is to track mountain hare and give my guest, who has made the long journey from the south coast, the chance to photograph them. 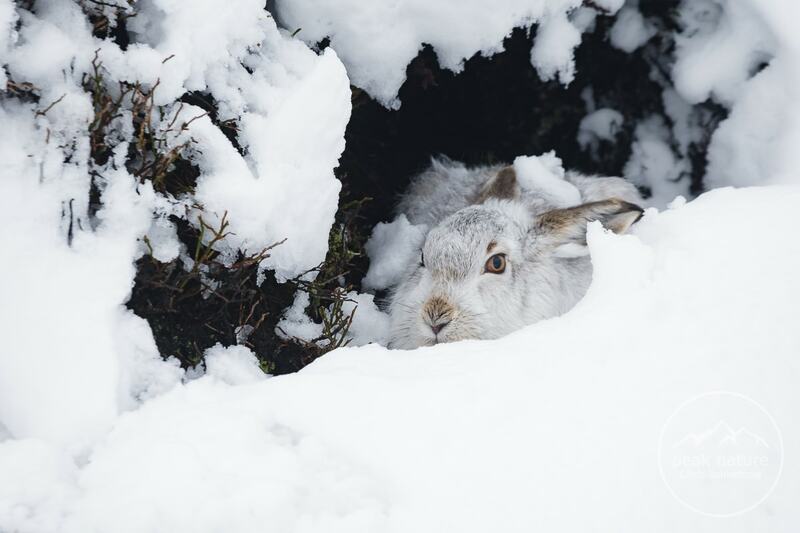 More often associated with the Highlands of Scotland, the Peak District is the only other area in the UK to see Mountain Hare. At a quarter of the size of the Cairngorms alone (not to mention other areas of the Highlands), the Peak District National Park can only support a fraction of Scotland's hare population. A smaller area means smaller habitat, making the hare easier to find, right? In theory, yes, but we're still talking about vast areas of land and the hare are experts at subterfuge. The population density in the Peak District is also lower than in Scotland, so there are fewer hares per square mile. These hare are no easy subject to locate, let alone photograph. I've been watching the weather forecast closely for the past 24 hours. There has been snowfall and our intended location for the day is accessed by a road that is often closed due to bad weather. Sure enough, I check my phone for updates and see that the road is closed due to snow. Scraping the ice off my car's windscreen, I consider whether it's best to go straight to plan B. The morning is dark and quiet and although there is no snow falling, I know the same can't be said of the higher areas of the Dark Peak. I meet up with Mark, my client for the day and we chat about how the day is going to pan out. With safety at the forefront of my mind, I opt to use my secondary hare location as our first port of call for the day - it's a longer drive, but may yield more hares and if conditions improve, we might have time to visit both locations anyway. By 8:00am we are parked up, geared up and starting our walk up into the moorland. Getting acclimated to the day's physical demands doesn't take long as the first half hour involves a relatively steep climb, taking us beyond the treeline and up onto the first plateau of moorland. There is a good 2-3 inches of snow on the ground and the effort of padding through the white stuff is almost as difficult as sticking to the indistinct path. What is revealed as we climb, is that the hares have been very active with tracks crisscrossing the path and leading off in various directions. It's tempting to stop and enter 'hare-mode', the term I use to describe when you actively start looking for the animals. In 'hare-mode', your movement is more considered and balanced. Moving across the open moorland, you often step on uneven ground, causing your body to shift suddenly to one side. A sharp, unexpected movement like this can spook a hare (especially if it's spotted you and you haven't spotted it) and in this situation, the most likely outcome is that you look on in surprise as the hare disappears over the horizon in a matter of seconds. Looking around, I know it's unlikely there are any hares close by. There's a decent gale blowing from our left hand side and our current location is much to flat to offer the hare any kind of protection from the cold wind. We hedge our bets and carry on at normal pace up another incline to the highest point on our journey. Although windy, conditions are good. The clouds are moving across the sky quickly, with the gaps in between flooding the moorland ahead of us with light. We watch the illumination progress down the opposite hillside, being chased by a veil of shadow as the gap in the cloud closes. After another 40 minutes of walking, we arrive at a section of undulating ground typical of peat moorland. These peat hags are areas that have become eroded by water flow. Where the ground doesn't have sufficient stabilisation from the surrounding plants, great mounds of exposed peat remain, giving cover to mountain hare from the elements. Unfortunately, we're approaching the peat hags from the wrong angle with the wind behind us. It's likely the hare will be facing the same way, meaning we'll come up behind them. To go around the area would waste too much time, so we slow our pace and keep our eyes peeled. Moving up and down through the hags, now fully in 'hare-mode', I spot a mountain hare to my right. I drop to a crouching position and Mark, who has wisely been watching his step over the uneven ground, sees me kneel down and follows suit. I don't think he knows it, but my heart is racing. For me, the exhilaration of seeing a mountain hare in their natural habitat, even for the hundredth time, is just as exciting as the the first time I encountered one. By kneeling down, we dropped out of sight of the hare. Although we were probably only in view for a second or two, I always assume the hare has seen us. There are two outcomes: either the hare has seen us and bolted away while we were getting out of sight or; the hare has seen us and decided to stay put to see what type of a threat we pose. Slowing raising my head above the snow-covered heather, I see that the hare opted for the second outcome and is sat, as expected, facing away from the wind. Assessing the situation, we realise we can slide down into a gully to our left, walk on a few metres and turn right into an adjoining gully to slowly emerge from a rise in the ground and see the hare head-on. Approaching a mountain hare with the hope that it won't detect you is nearly impossible. To think the hare won't realise you're there given its sensory adaptations is folly and the only alternative is to make your presence known from a comfortable distance, slowly working your way closer to demonstrate that you're not a threat. Of course, no two hares are the same and some might decide to high-tail it over the hill with you still 30 metres away, but a surprising number of them will tolerate your presence. Our progress now is deliberately slow. We move into position so that we can both see the hare and slowly shuffle up the side of the peat hag over the course of 20 minutes or so. 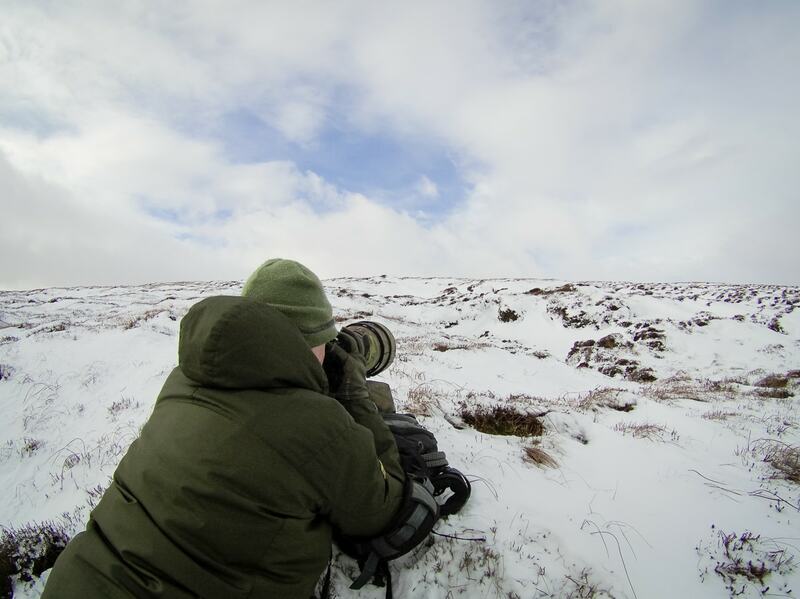 Mark has seen his first mountain hare and is impressed with how well it blends into the surrounding terrain. It's a great feeling to provide this opportunity to my client and he grabs a couple of shots from a distance, but the hare soon gets up and moves away from us through the maze of peat hags. After a spot of lunch in the cover of another peat hag, I lead Mark up over the top of the hill to check the lee-ward side. Although there are more likely to be hare here, this is also where the snow is thickest so progress will be slow. We've not been looking long before a hare breaks cover about 20 metres ahead of us. I only spot it out the corner of my eye, but coming to a halt, we both catch a glimpse of it as it re-appears, then disappears, then re-appears again over the bumps on the ground. So there are definitely hares in this area. We continue onward. 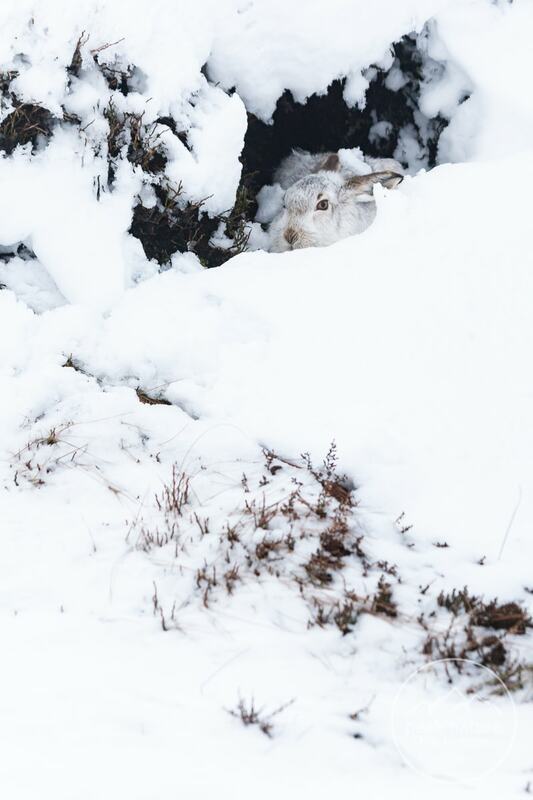 After another 5 minutes or so, I glance to my left to look up the slight gradient and spot a hare-shaped lump tucked in beneath a peat over-hang, partially covered by snow. I drop to a crouch again and take another short peek to confirm it's actually a hare. We're lucky to be in a good position to approach this one, a couple more paces and we would have dropped down below the hare and had a hard time seeing it while we moved closer. As before, it's now important to take our time and not rush our approach. We sit, just in view of the hare, for about 10 minutes and eat a chocolate bar (or was that just me) before setting our rucksacks aside and packing our pockets with spare batteries and memory cards - we may be here for some time! Crawling forward on our stomachs a metre at a time, we try to keep a tight formation. Splitting up or moving too far apart can give the impression that you're trying to surround the hare, which is likely to result in it running away. After about 20 minutes, we're still several metres away but able to start making some images. Fixed focal length lenses have the benefit of being able to take in some of the environment. Large, fast prime lenses are heavy bits of kit and it takes a fair bit of effort to move slowly and quietly through snow carrying one so it's perhaps just as well we are not in a rush. Getting closer to the hare, we can see she is a gorgeous individual with bright, lively brown eyes. Another 20 minutes later and we've closed the gap to around 8-10 metres and can start shooting some portraits. In all this time, the hare has barely moved an inch. As if sensing me thinking about how still she is, a tiny pink tongue flashes out beneath her nose as she licks her lips. These mountain specialists are experts at conserving energy and tucked away as this one is, she can avoid the wind chill while remaining relatively safe. The last thing we want to do now is force her to leave her warm, protected form and waste energy running away from us, so we maintain our position making only slow, steady movements and speaking only in low, monotonous voices. Over the course of the next 40 minutes, we adjust our position for some more head-on shots and get within 7 metres so that Mark can make some full frame images. Checking the time, we reluctantly conclude we should start heading off the hill - descending in the dark is not for the faint-hearted. After a few more shots, we slowly shuffle as quietly and elegantly as possible, 'rolling' down a shallow decline and out of sight. It wasn't elegant. We're both buzzing from our experience and happy that we could leave the location knowing we'd hadn't stressed or worried our subject, but we have a fair old march ahead of us and so begin the two hour walk back to the car. During the walk back off the hill, we talk about wildlife, conservation, volunteering for charities and a whole host of other topics. I really enjoy learning about other photographers and their approach to nature and the outdoors. Even before starting up the hill, I had learned that Mark shared many of the values I consider important, so it didn't take long to get into some lengthy discussions on certain topics. Dusk is on the horizon as we arrive at the car park and the pink in the sky matches the colour my cheeks always turn after a windy day on the moors. I thank Mark for his company and wish him a safe journey home - it's a fair distance back to the south coast. Setting off for home, I check my phone for traffic news and find that the road closure that prevented us from visiting the primary site earlier had been lifted about 6 minutes after deciding on plan B. Although I'll never know if we would have faired better elsewhere, one thing I am certain of is that we had a successful day with the Mountain Hare and I'll sleep like a log tonight! I had the most amazing day with Chris. We had over 8 hours on the hill. Chris' knowledge of the environment we were in was impressive, and we were able to spot and then stalk up to the hares, getting to within 10-15 metres. His knowledge of the species meant that we were able to spend an hour with one animal, leaving it undisturbed when we left. I couldn't recommend the day more highly - worth every penny! If you are interested in photographing mountain hares with me you can find all the details you'll need on the mountain hare workshop page of the website.